Yet I’ve promised a little update to the Lamy nibs and to answer some questions I have been asked repeatedly. What you can see in this picture are three different kind of nibs. The oldest one is on the left, the newest one on the right. The one on the left is about ten years old it was a default nib that came with one of my pens. As you can see there is no indication of size on it. It also lacks the Lamy logo. The nibs that came as default some years ago would not have any size indicated on them. (Nowadays they all have.) So if you bought a new Lamy pen back then, you needed to pay attention to the little sticky on the pen which would tell you what size the nib was or ask the seller to give you a pen with your prefered nib size. If you lost that sticker, don’t remember that information anymore or have bought the pen second-hand, there is no way to find out which size it is. You could try to compare it to other nibs if you happen to have some ready, of course, but other than that there’s no way to find the answer to this question I’m afraid . Sometimes people wonder whether the newer dark nibs are made of a different material, because they have that lighter tip, but I don’t think so. My guess is that the difference is just caused by a new/different way of producing those nibs. 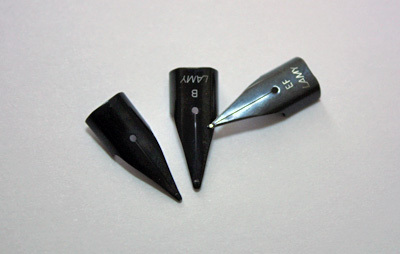 However, purely from the esthetic point of view I admit that I also prefer the old nibs that were all black ;). I was already about to throw this painting away, because it was started with the wrong colors, but then I thought why not give it at least a try. If the colors (W&N Artisan) are going to crack, I can still throw it away, if not, maybe it turns out nicely. If my memory doesn’t fail me I remember having read somewhere in the Artisan spreadsheets that those colors weren’t suitable for glazing techniques. I cannot remember the exact reason why, but my best guess would be because their whites could be made with safflower oil? Well anyway, since I’m a curious person and would like to see myself what will happen I decided to give it a try nevertheless. This is my underpainting, it has been touch dry for a couple of days and tonight I’m going to start with the first few glazes. This year in April I became infected by the ABJD-Virus. No, it’s nothing serious, don’t worry, it’s just expensive. Horribly expensive. ABJD is an abbreviation for Asian ball-jointed dolls. They are really beautiful, such cuties ^^! If you haven’t heard of them before and want to check out some examples, just follow the following links to marvel at their beauty. And their prices. Now since the dolls themselves are that outrageous expensive (or do you consider up to $ 700 for one doll as reasonably priced?!? ), I just had to economize somewhere and so I started sewing at least the outfits for them myself. Phew, sewing turned out to be quite time consuming, so I didn’t find much time for painting the last weeks. However, now that I’m broke (yes, I ordered a doll), I have more time for drawing and painting again. Today I’m just a little bit sad. Since I’ve been told many times that blogsome causes trouble with various rss readers I felt forced to move to this new blog hoster. I’m feeling sad, because I miss the possibilities of page design that I had with blogsome, but on the other hand what is a blog without a proper working rss feed?! I sincerely hope that this wordpress blog will do better! 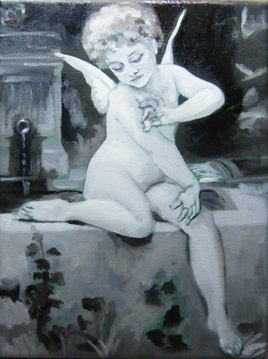 You are currently browsing the Uncategorized category at : silviasblog.com :.